Some of us are follicularly challenged or our social situation prevents us having long feminine hair. 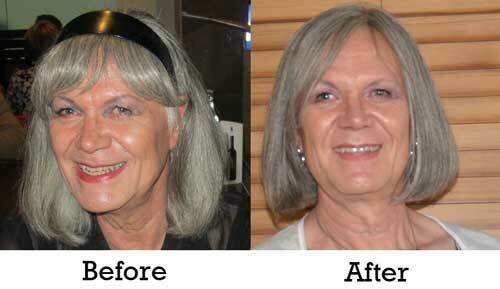 For those, there are several shops selling quality wigs and are experienced helping cross-dressers. "The Breastform Store does not just sell breastforms, but they also sell a range of quality Henry Margu wigs. As with all their products, Tanya and David offer great service and advice about wigs. I have bought two wigs from them at very reasonable prices." - Christine. "A group of us visited this shop as part of our Pre-Ball Shopping Trip in 2012 and repeated the visit in 2013. It is staffed by several of the former Celebrity Wigs Store at Bondi Junction, which closed some time ago. They have a big range of synthetic and human hair wigs for sales. The service and interest by the staff was very good." - Christine. "Kylie is a specialist bespoke wigmaker with extensive experience in the film industry. She can make individually designed and fitted wigs and hair pieces with top quality imported European hair. Naturally products of this high quality are, of course, not cheap, but well worth the cost for those who do not want to look like they are wearing a wig." "Kylie was wonderful with the initial consultation and later the fitting and styling. She is very professional and expert in her craft, as well as being friendly and respectful towards transgender and cross-dressing clients." "I am delighted with the result. Previously, I used a synthetic fringe held in place by a head band, which looked less realistic and was somewhat uncomfortable. The new hairpiece is made of human hair, matched to my own hair. It is very comfortable and it looks and feels like my own hair." "The photos below will give you a comparison" - Christine, December 2013. "Celebrity Wigs has been around many years. Good and helpful shop on Oxford Street and excellent on-line shopping. Staff are realistic and supportive. I'd bought my wig elsewhere but I took it into Celebrity Wigs for a styling. No charge and a good chat on things you should know about wigs! Nice! I came back." - Jan.
"I bought a new wig here when I first started going out in public. The service was excellent. Subsequently, after I grew my hair long. I bought a couple of fringes to fill out the rather thin front section of my hair. They also sell wig shampoo and conditioner - a must for keeping your wig clean and in good condition." - Christine. "Their Sydney shop has closed, but they are still operating a shop in Melbourne and purchases can still be made online." - Christine, August 2012. "Wigs On Wheels is a friendly, free and discreet mobile wig service that comes to you in the comfort and privacy of your home (hospital, hairdressing salon). We are discreet service meaning we have no advertising on ourselves or our cars." - From their website. Australia's No.1 Party & Fashion Wig Website. "We have a full range of high quality fashion wigs and very affordable prices. Save up to 90% of recommended retail prices at Australia's largest online wig web store!" - Email from owner.